This is the fifth and possibly last (I hope not!) book in Joel Jenkins Gantlet Brothers series. In this book, Joel digs into the Gantlet Brothers past adventures with nine amazing stories. The first story, ‘Beneath the Gargoyle’s Ever Watchful Eye,’ we discover why the Gantlet Brothers leave East Germany by going over the wall, in their own peaceful way. Lots of bullets and explosions are involved. Next is ‘The Ten,’ Bruce Willis fans of ‘Die Hard’ will love this. The Brothers are attacked in The Croxton Building (great name for a building) by an elite mercenary group, who were hired by someone in the Gantlet Brothers past. Maybe The Ten should consider a new career. ‘Five Rounds in Vegas’ Matthias Gantlet has a friendly chat (not) with the Heavyweight Boxing Champ in the locker room. Former Welterweight Champion Ricardo Croxton (I’m much better looking and a bit larger) makes an appearance as the commentator for the fight. ‘Final Round in Vegas’ happens immediately after ‘Five Rounds in Vegas.’ Matthias, Sly and friends discover that things and people are not always what or who they appear to be. Also, Ricardo Croxton discovers gambling’s rewards. 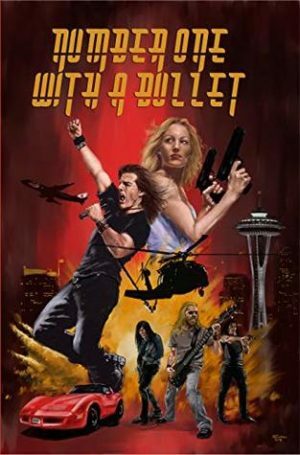 ‘One Night Near Black Rock.’ If Zombies, guns, hot girls, good beer, guns, and explosions are what you like, this is for you. In ‘Vengeance From Vietnam’ Matthias discovers that the past won’t always leave you alone, when he and his BFF, Blake meet up with a group of bikers that unpleasant plans for Matthias. Could this be Mathias last song? Up next is ‘The Resurrection of Hal Alden.’ What do you get when you add two Gantlet Brothers, a C.I.A. Agent, and a few assassins? Mayhem and murder in excess. Plus one of the assassins was taking a nap in the morgue and woke up to join in. ‘The Drum Beats a Mournful Dirge.’ Mitz Gantlet discovers that the fashion world can be a very dangerous business in ways he didn’t plan for. ‘Fit For a Leather Coffin’ is the last and shortest story of this collection. Otto Ganlet has an explosive meeting with someone from his and his brothers past. All nine stories are a great way to discover just how great The Gantlet Brothers and Joel Jenkins are. Be sure and read the rest of Joel Jenkins books.